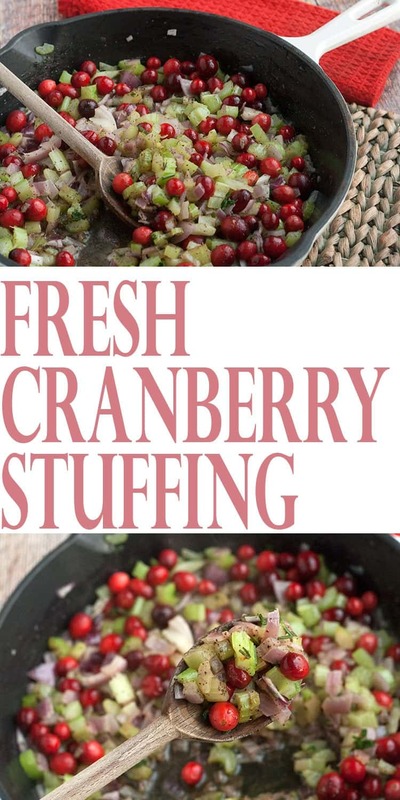 Fresh cranberry stuffing is an easy way to jazz up a classic Thanksgiving stuffing recipe. We’re talking a tasty side dish that pairs perfectly with traditional turkey day faves. This easy to make Thanksgiving side dish is one you won’t want to miss. I love making Thanksgiving food. The house fills with aromas and I get to nibble on the relish tray as I cook. Not to mention the occasional raw ingredient that slips into my mouth. A piece of celery here, a pecan there. Stuffing has always been one of my favorite side dishes. Pairing up cranberries (grown in Wisconsin cranberries no less), with the standard sage and onion stuffing recipe that I typically use was a no-brainer. 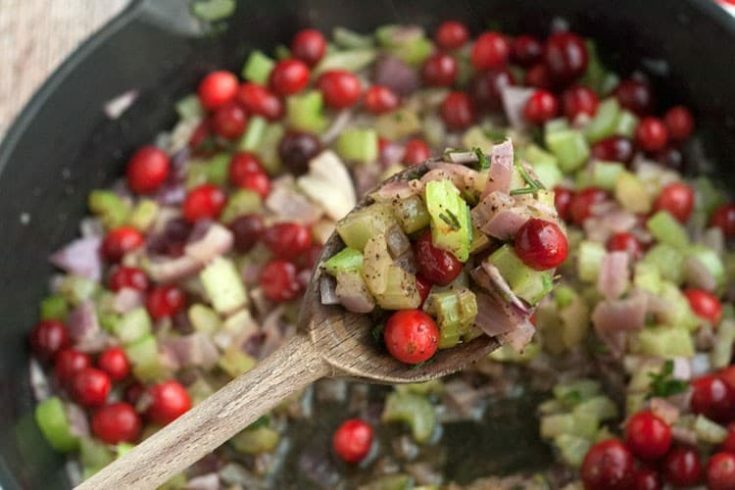 The combination of savory flavors of sage and onion, along with the tartness of cranberries, gives some variation to a dish that is quite interesting from one bite to the next. Let’s face it. It wouldn’t be Thanksgiving in most households across the United States without the traditional cranberry sauce recipe. Assuming that you make cranberry sauce from scratch–and if you don’t, please consider trying this 5 minute recipe- you already have this delightful red berry on your shopping list. 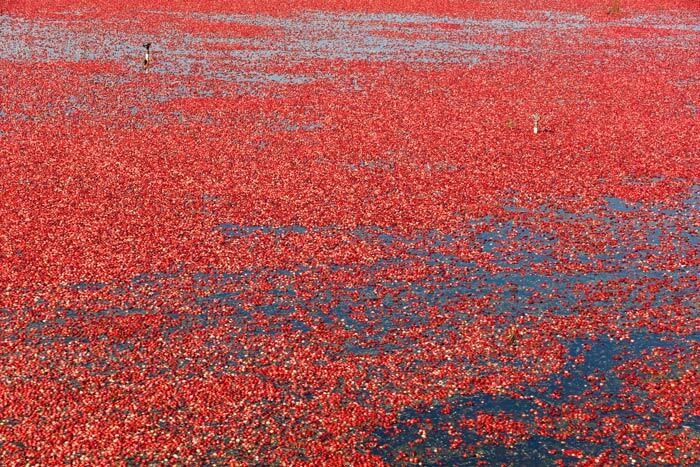 It might seem silly, but visiting a cranberry bog during harvest time is on my bucket list. Since I really want to see (first hand) how cranberries are harvested, it’s convenient that I live in Wisconsin. I can probably really make that bucket list idea a reality. While I can’t get enough of traditional turkey stuffing recipes–in fact, I have to admit to being one who eats more stuffing than turkey–there is something to be said for the festive and traditional Cranberry Sauce. I made this cranberry sauce recipe using fresh cranberries last year and it was a pretty big hit. And if cooking with fresh cranberries sounds intimidating, it shouldn’t. Sure, it’s not a can-shaped jelly form that you may remember from Thanksgivings past. Looking for more cranberry sauce recipes for Thanksgiving? We have a big roundup of cranberry sauce variations to check out. We all know that Thanksgiving can be stressful if there is just one cook in the kitchen preparing everything. That’s why I like to have a list of Thanksgiving side dishes to make ahead of time. Our Cranberry twist on our standby Sage Onion Stuffing can easily be made a day before, or even earlier if you’re looking for make ahead Thanksgiving recipes to freeze in preparation for the big day. To start preparing the stuffing, melt butter in a large skillet. Add in celery and onion and saute for five minutes. Add in cranberries, chopped herbs and seasonings. Stir and cook for an additional minute. Doesn’t this just look delicious? Next time I make this stuffing, I’m going to switch it up a little bit more and add in some sausage. I’ve used sausage with my Sage Onion Stuffing before, so I know the combination will be amazing. The extra flavor that our Sausage Cranberry Stuffing recipe variation will be so rich and scrumptious. Thanksgiving dinner can’t get much better than with this recipe! After sauteing the colorful veggies, berries and herbs and infusing all those flavors together, it’s time to add in chicken stock and the stuffing. I used pre-packaged unflavored white and wheat bread cubes to save time. And although I do like making my own chicken stock, I used store bought since I didn’t have any in my freezer–and that is perfectly fine to do when you’re trying to make easy turkey stuffing recipes. The whole point is to keep it easy, right? Stir all the ingredients together and allow the bread to soak up the liquid. The best Thanksgiving Stuffing recipes should be well presented, shouldn’t they? 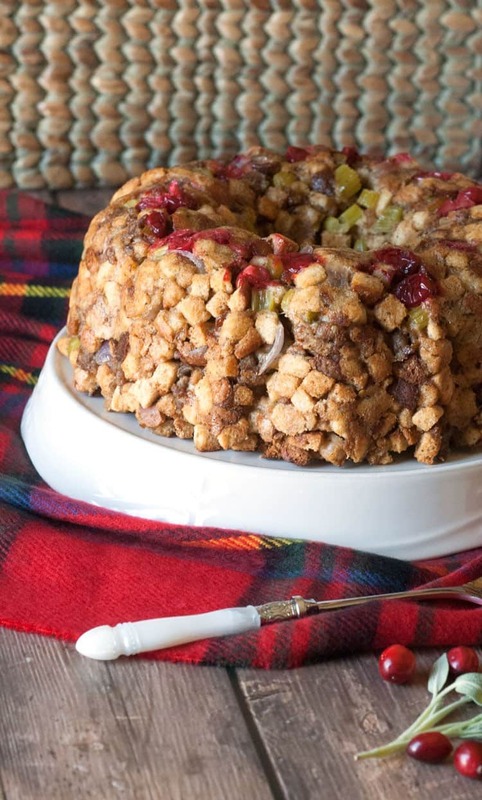 Try baking stuffing in a bundt pan this year. It makes for a super decorative, yet simplistic, table display and I’m sure that your guests will rave about how beautiful it looks. The ease with which this recipe comes together is impressive. And the gorgeous display it makes when you use a bundt pan? Well, that’s really hard to beat! Melt butter and saute onion and celery for five minutes over medium heat. Add in cranberries, fresh chopped herbs and seasonings. Saute for an additional minute. Combine chicken stock, stuffing and sauteed mixture together until well mixed. Pour into a round bundt pan that has been sprayed with non-stick cooking spray, and press the stuffing down so it is well packed in. Remove from oven, place cake plate on top of the bundt pan and flip over to release stuffing from pan. Serve and enjoy! What’s your favorite Thanksgiving stuffing recipe? I never thought about putting my stuffing into a bunt pan. What a great idea.